Can we all just please say “summer come fast.” I have enjoyed using this bag already, I know it should be a beach bag but why not pull it out a bit sooner. 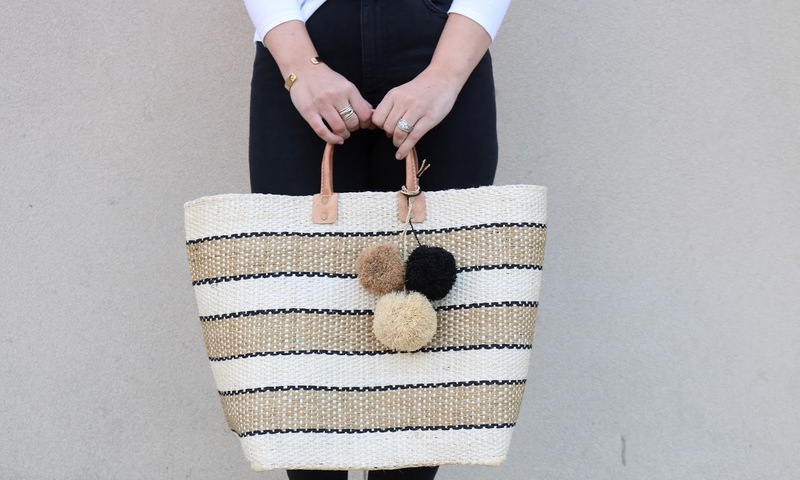 I have gotten quite a few complements on how cute the pom poms are, it’s true since that is one of the reasons I had to have the bag! This past weekend was super exciting and busy! We got to celebrate Jonathan’s birthday and we did a staycation overnight on the beach. It was mixed feelings during the process since we had our first official night away from the baby. It was a little emotional but a good practice run since we will be away 10 days in just a months time (I have no idea how I am going to make it that long). Please keep my in your thoughts as I start to mentally prepare for that trip. Next Post High Slit Anyone? That is the cutest bag! Perfect with your white and black outfit. I have been also about ruffles lately. Might need that tee. Sounds like such a fun weekend. I understand you didn't want to keep that beaut in the closet for longer, it's really pretty and it combines perfectly with that white ruffled top. It must be hard to be away from your little one for so long, but I am sure you will find a way to enjoy those holidays! It seriously needs to be summer now! That top is gorgeous. Love the ruffles and your tote bag is so cute! that is such a cute tote bag! super cute post! Super cute details! I love that tote bag with the pom poms. It compliments your ruffle shirt so perfectly. Oh, I just love this look! 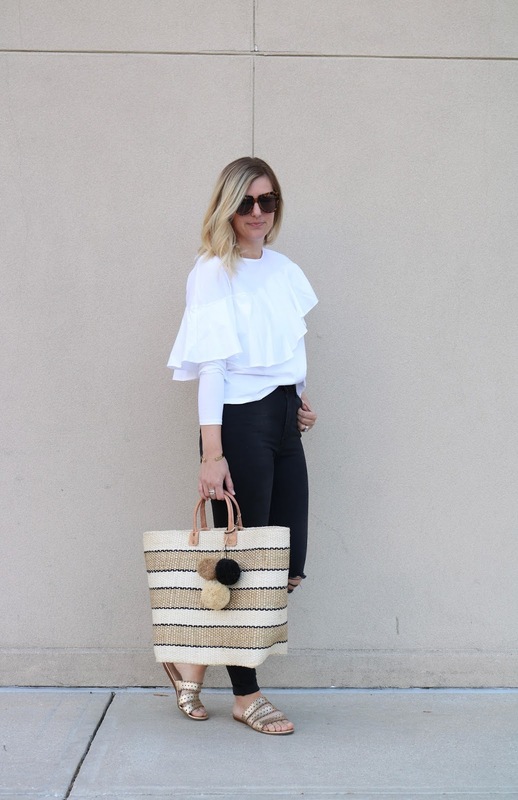 The bag is so fun and your top is just the cutest! Love the ruffles!